"Determined to Overcome 奋強突固 (fèn qiáng tū gù) "
One of the most feared characters in Kingdom Wars, in my opinion. No, seriously! I would almost put him on the same level of offensive ability as Diao Chan 貂蝉, simply because he has the potential make any player lose life simply by discarding one card. But before you start screaming "IMBA! ", I have to also state that the number of rounds where a Yue Jin-combination has won is not significantly high. Thus even though he seems powerful, it just doesn't translate into a sure-win. Lots of skills and strategy is still required to use him well. I like this guy already!! One of the five generals of the early Wei Kingdom (the others were Zhang Liao 张辽, Xu Huang 徐晃, Zhang He 张郃 and Yu Jin 于禁), Yue Jin was the vanguard of many battles. He served Cao Cao 曹操 since the warlord rallied armies to join the Coalition against Dong Zhuo 董卓. Despite his short stature, he always fought at the frontline, and willing to be the first one who stood into the fort of enemies. 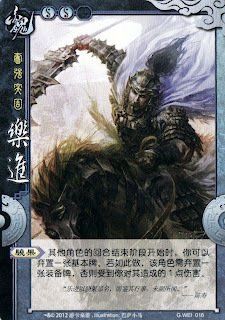 Character ability: "Dauntless 骁果 (xiāo guǒ)"
At the ending phase of another player's turn, you can discard a basic card. If you do so, that player needs to discard an equipment card, or else you inflict 1 unit of damage to that player. This is a brand new character specifically created for Kingdom Wars. “Dauntless” comes from the description “Yue Jin was famed for being dauntless 乐进以骁果显名”. This ability allowed Yue Jin to attack multiple times at the cost of his own defense. His enemy was forced to choose between withdrawing their fortifications (discarding an equipment card) or suffering damage from Yue Jin. How many times can you use this ability per turn? Can you use the ability on a player who has no equipment cards? Yes you can, they can choose to discard an equipment card from in front of them or from their hand. So if they have no equipment cards they take 1 damage.